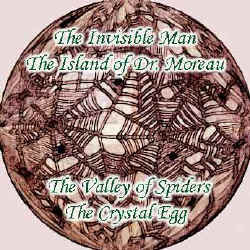 The Valley of Spiders by H. G. Wells, performed by Patrick Horgan. H. G. Wells is a masterful story-teller. This short story is exceptionally well-told, it stands alone yet suggests an intriguing 'prequel' and 'sequel' may be unearthed some day. Do not listen if you suffer from arachnophobia ... you may never be the same again.